I am sure all the children are very excited, as we are, for our Summer Scheme to get under way! Hopefully the weather will be great! As we have outstanding facilities all around the school we can offer additional different indoor activities if required. Some of you may be aware that building work is going on adjacent to the front of the school. This means that access to the front entrance is limited to school office staff. 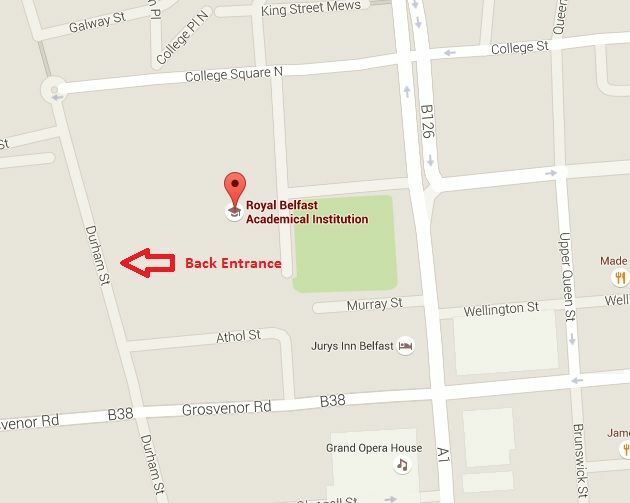 The summer scheme will be using the back entrance off Durham Street (see map below), which is just around the corner. This was the same as last year and had no impact on our use of the wonderful facilities. This year as a bonus the school have also offered us the use of a shuttle service to Osborne playing field for afternoon sports and other activities. We will look to use this in good weather. All children will be back on site for 3.20 p.m. Early drop off time are from 8.30 a.m. Early pick up when activities finish is at 3.15 p.m.
Late pick up is at 5.00 p.m. The back gate will be closed after 10.00 a.m. and reopen at 2.30 p.m.
You will be greeted by members of the team on arrival, and the entrance is manned by a member of the R.B.A.I. ground staff. The hub of the scheme is located in the 6th form centre. Children are to bring their own packed lunch. There will be a small tuck shop available if any child wishes to purchase soft drinks and snacks. A consent form must be completed and handed in on arrival on the firstmorning. I will have some spares so don’t panic if you leave the house without it as it will be e-mail out as well. Please bring swimming kit each day. Although there will not be swimming every day, we have the option of using our fantastic 25m swimming pool and holding additional swim classes if the weather is poor outside. We will not be outside in any rainy or cold conditions, therefore suitable clothing should be brought for many of the sporting activities. Trainers should be brought. If it does happen to be very hot, please advice the child to bring their own sun cream. We have lots of children attending our scheme. We could accommodate a couple more if anyone has friends interested. I’d be happy to offer a £10 cash referral. They just need to contact Peter Sheppard on 02895 609330. If anyone has any queries feel free to contact me at any point this week!